The 2018 season was expected to be a breakout year for the Philadelphia Phillies. After losing 89-plus games each year from 2013-17, the Phillies were set to incorporate several prized young prospects into the everyday lineup, and they had a bright new modern manager in rookie skipper Gabe Kapler. The transition from rebuilder to contender was underway. The Phillies did improve in 2018, but only to 80-82, and they collapsed down the stretch. Philadelphia had the National League's second best record at 58-44 on the morning of July 27. They posted the fifth worst record in baseball thereafter though, losing 38 of their final 60 games. It was a disappointing finish to what had been a very exciting start to the season. When the Philadelphia Phillies lost their ninth consecutive game toward the end of last September, veteran first baseman Carlos Santana felt like he needed to send a message to his teammates who he said spent portions of the game against the Atlanta Braves playing video games in the clubhouse. 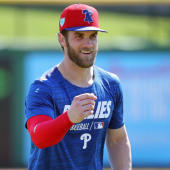 Santana grabbed a bat, retreated to the room at Citizens Bank Park where the gaming took place and smashed the TV to ensure there would be no more "Fortnite" the final two days of the season. Video games are popular in big league clubhouses. Last September, The Athletic's Zack Meisel wrote a fun article about his attempt to dethrone Jose Ramirez as the "Mario Kart" champion in the Indians' clubhouse. This generation of big leaguers grew up playing video games. But during a game? No way. That's a major no-no. It's surprising this stayed under wraps so long. It should be noted Passan's article indicates the "Fortnite" incidents -- players sneaking away from dugouts crowded with September call-ups to play video games -- were not common, and that Santana doesn't believe Kapler's managerial style was a factor. Jake Arrieta told Passan he would've smashed something too had he known what was happening. Santana is no longer with the Phillies but not because of the "Fortnite" incident. "It was tough to include him in the trade with Seattle, but sometimes you have to trade good players to acquire other good players," said GM Matt Klentak to Passan. Santana was included in the Jean Segura trade to offset salary and allow Rhys Hoskins to move back to his natural first base position. The Phillies overhauled their roster over the winter, signing respected veterans Andrew McCutchen and David Robertson, and trading for Segura and J.T. Realmuto. They also signed that Bryce Harper guy, who, despite receiving more attention than any player in the game, can never be accused of not playing hard or quitting on his team. Consider the "Fortnite" incident a learning experience for a relatively young team and a young manager. Even with Santana gone, the Phillies strengthened their leadership core over the winter, and they improved on the field quite a bit as well.